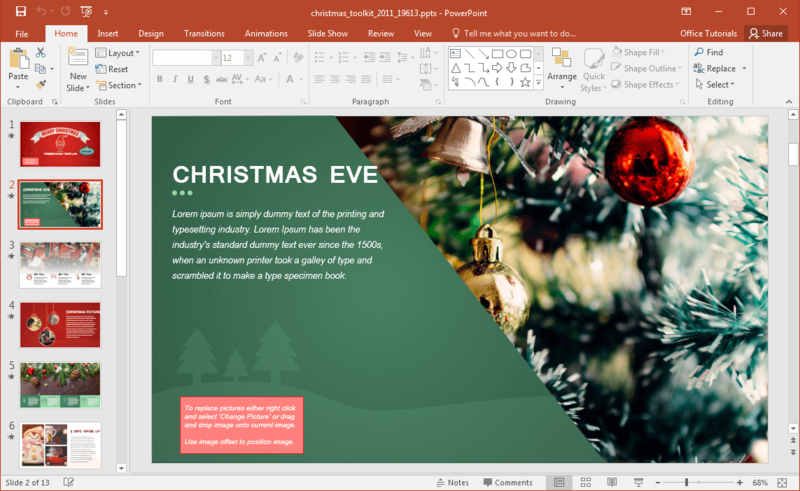 Christmas toolkit is a Christmas presentation template for PowerPoint which gives just what you need for making Christmas themed presentations with ease. With uniquely crafted layouts, Christmas clipart, editable slide designs and animations, this animated template is a good resource for making your Christmas and Holiday Season slide decks using readymade layouts. 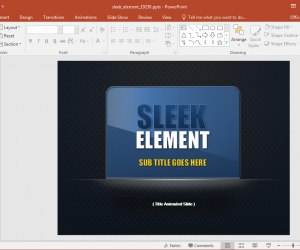 The title slide provides two links which gives you the option to further customize the template. 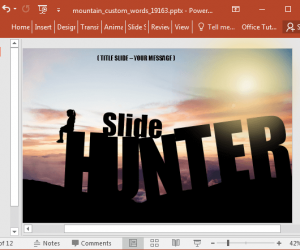 One of the links is for downloading the fonts used in the template, while the other is for customizing the contents of the banner used in the titled slide. 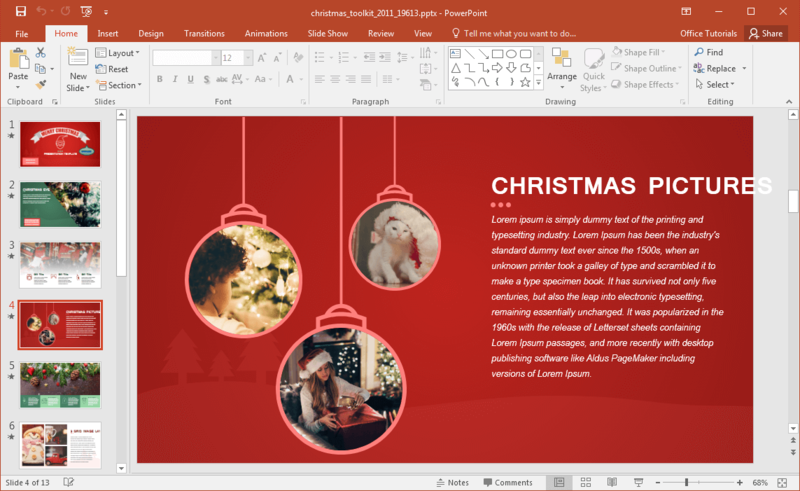 The default banner says “Merry Christmas”, whereas you can comprehensively edit and create a new one using the link given in the opening slide. 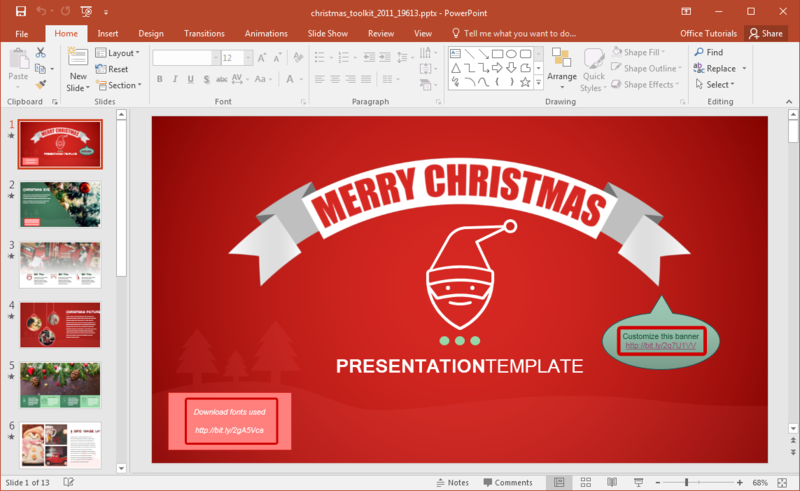 This Christmas presentation template contains as many as 13 slides, with a number of layouts, clipart and editable slide designs for you to choose from. 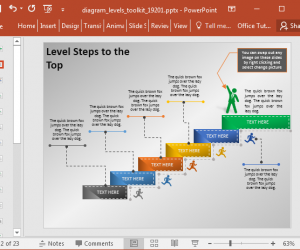 The various elements within slides are in editable form, which means you can remove or reorder them conveniently. 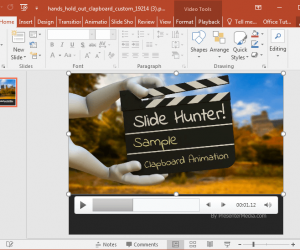 There are helpful tooltips in different slides which provide additional information about how to edit the slides and replace pictures to design your own slides. You will find a lot of sample images in different slides which you can either choose to keep, or replace with your own to create a customized version of sample slides. You will also find Christmas clipart and icons in different slides. 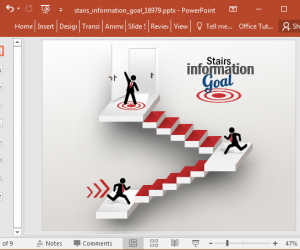 These icons and images can be copied, resized and colored from within PowerPoint. 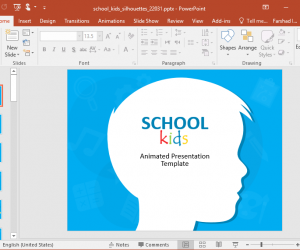 This gives you the utility to easily incorporate various icons and clipart in your slides, which gives you more flexibility in designing your Christmas and Holiday Season slide decks. 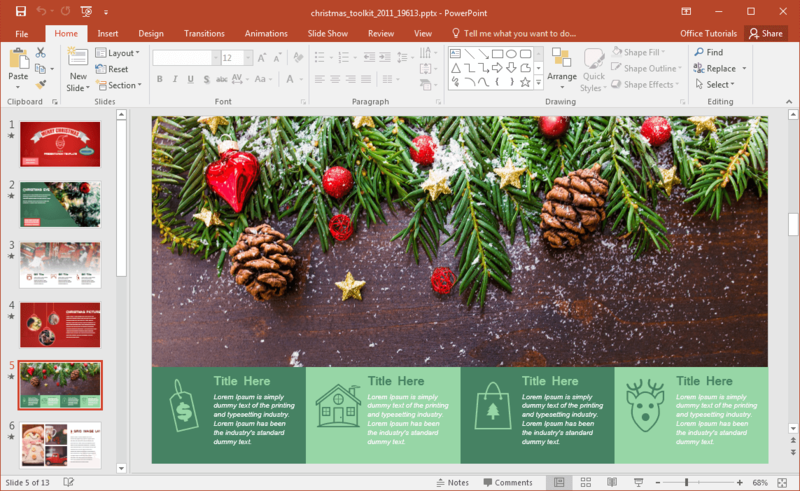 You can download this Christmas Presentation template in Widescreen or Standard format, with the option to edit the title slide banner separately using the link in the first slide.